On this week’s show, and my very special guest is Sue Woodard. I’ve known Sue for well over 10 years. Sue Woodard is now the Chief Customer Officer at Total Expert and she’s a Mortgage Industry Expert. 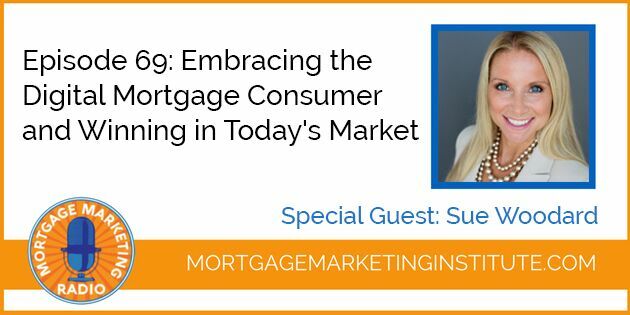 Sue brings over 25 years of mortgage experience leadership to the industry. She has been helping Loan Officers for well over a decade breakthrough barriers and sharpen their skills. She’s particularly talented in helping Loan Officers get connected to their real passion, and understand how to navigate in today’s digital market. And so, in this episode, Sue and I are talking about is year being the tipping point, as she calls it. And that this year is gonna be a tough year. It’s gonna be a challenging year but one that has opportunities as well, and that’s simply because I think we’re finally at that place of the convergence of technology reaching critical mass in the mortgage space where there’s a lot of talk about being displaced by technology and push button mortgage. If you enjoyed this episode, please share with your colleagues & friends and leave a comment below letting us know what you thought. Or, you can leave a rating & review for Mortgage Marketing Radio on iTunes. That way, it helps other professionals discover the show. Finally, you can subscribe on iTunes or Stitcher to get all new episodes when they are released.